« No More Pants For Wonder Woman? 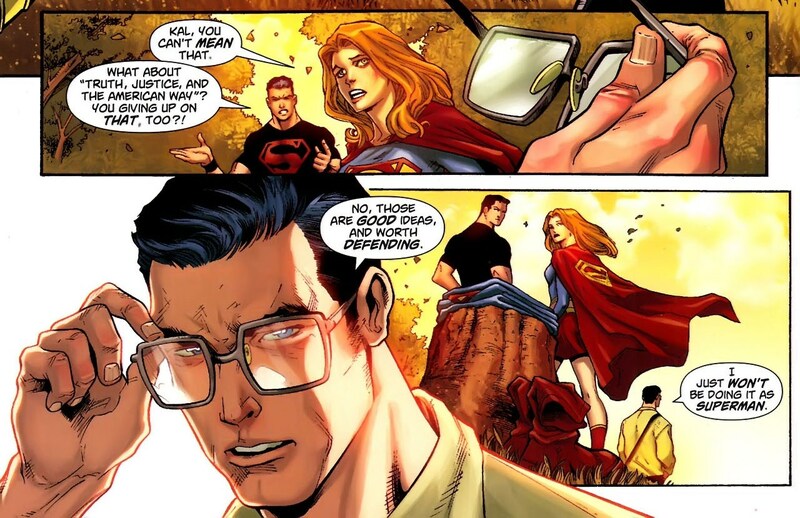 I read Superman #713 last night, and I was slightly amused and then really annoyed by the story. Not because “Grounded” is super dull, which it is, but because DC appears to be going out of their way to avoid any sort of bad press whatsoever. DC’s not had the best year, publicitywise. Up until the relaunch, which finally got them some positive press, the two biggest news stories to come out of DC were Batman’s new Muslim friend Nightrunner and Superman renouncing his American citizenship after attending a peaceful rally in Tehran, Iran. Both of these stories were met with outrage by the folks at Fox News and other right wing media outlets, because of course Islam = terrorism and Superman responding to the geo-political reality of today instead of saying America is the best thing ever is evil and wrong. Meet Los Angeles’ newest super hero in the latest chapter of “Grounded”: Sharif! But Sharif discovers that in today’s current cultural climate, some people don’t want his help – they just want him gone. Can Superman aid Sharif and quell a prejudiced public, or are there some problems too big even for the Man of Steel to solve? It seems rather obvious that Sharif is a Muslim and that people are not to keen about that, and that Superman was going to stop by and teach everyone about tolerance and acceptance and whatnot. Then, with barely any notice, they scrapped that issue and printed an old story about Krypto the Superdog instead. Plus, since the relaunch hits in September and we’re going to have a whole new Superman, chances are this story will never see the light of day. Chris Sims at Comics Alliance wrote a great piece arguing that the issue was cancelled because DC didn’t want to show Superman teaming up with a Muslim superhero. 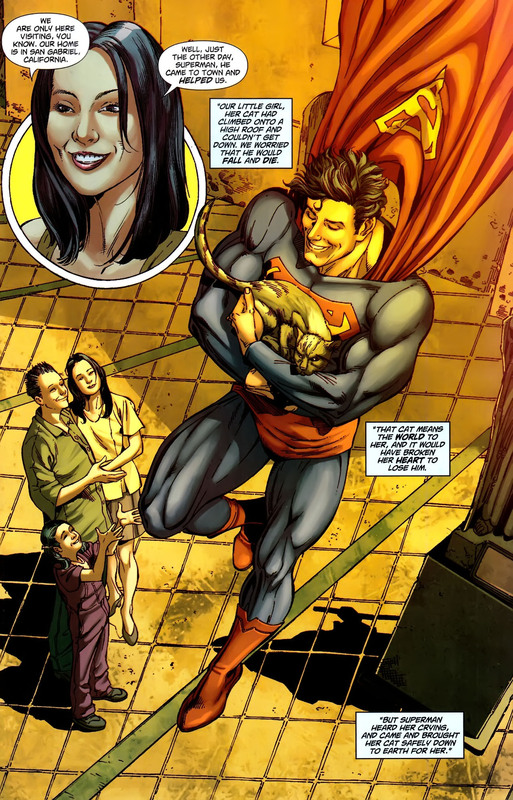 However, over at Bleeding Cool, Rich Johnston reported that the issue was scrapped because of a scene where Superman saved a kitten that editorial found too corny. Rich has mad connections in the comic world, so while it seemed silly, I figured that Rich’s sources trumped Sims’ speculation. He saved a kitten. A scene that a month before had SO offended DC editorial got itself a full splash page in the next issue. Know who wasn’t in Superman #713? Sharif. That dude was nowhere to be seen. Notice the emphasis in Clark’s response… “Those are GOOD ideas and worth DEFENDING.” Superman totally loves America, you guys. 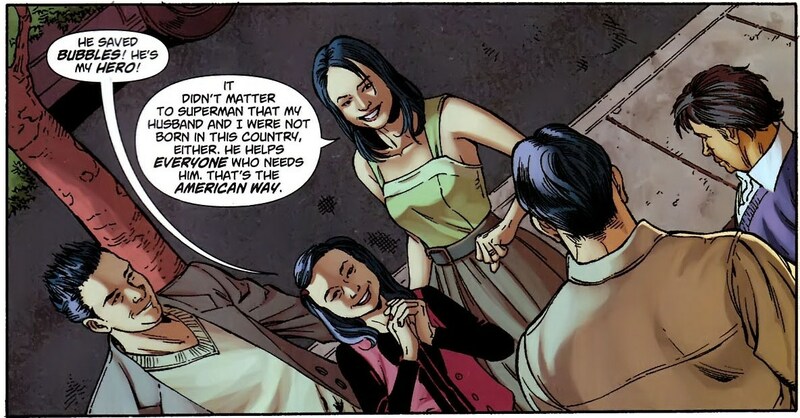 Yeah, Superman is a Super-American!! He helps EVERYONE. Except Muslim superheroes getting hassled in Los Angeles… he doesn’t do that. But Asians with trapped cats? Hell yeah!! AMERICA!! Superman fights for the very values America was founded on!! He is all about America!! Cutting out the story with the Muslim guy is pretty bad, but this over the top, pro-America sentiment is just blatant pandering. Avoiding Muslims just isn’t enough… Superman must be shown to enthusiastically love America and everything it stands for. It’s really sad. It’s cowardly, first off… scrapping stories because you’re worried about bad press and then epicly over-correcting with America love just to protect your relaunch is weak. But second, it implies that you can’t love America AND be accepting of Muslims, and thus that Islam is inherently anti-American. Cancelling the comic where Superman befriends a Muslim and then right away publishing one where the virtues of America are praised to the high heavens sends a very clear and VERY problematic message. If DC had published both issues, I think it would have been good… tying together acceptance of Muslims with American values is a lovely message. But in cancelling the issue, DC has made it look like one sentiment has trumped the other, and that’s just not cool. I love DC and I love Superman, but as a fan I’m pretty embarrassed and ashamed by this. This entry was posted on July 14, 2011 at 4:49 pm and is filed under Comics, Random. You can follow any responses to this entry through the RSS 2.0 feed. You can leave a response, or trackback from your own site.